It’s no secret I love cheese pairings. Although I usually turn to wine when planning a pairing, the recent popularity and quality of artisan craft spirits has opened up a whole new range of flavors to experiment with. Sipping on a local spirit made from a base of apples, peaches, rye or corn from Hudson Valley farms is the perfect way to end a great meal; add a few local cheeses and it can be a “spiritual” experience! Recently, I’ve made some amazing discoveries and found a wide range of cheeses that pair deliciously with our local bourbon, rye, applejack and even corn whiskey! The key to pairings is to first taste the spirit at full strength, then add a bit of water before sampling it with foods. The water will mellow the flavor and decrease the burn of higher strength offerings. Tuthilltown Spirits Distillery’s Bourbon’s are the most versatile when sampled with almost everything from salty, spicy blue cheese to aged hard cheeses. Their Hudson Baby Bourbon (my favorite) is a single grain bourbon made from 100% New York corn, mildly sweet with hints of vanilla and caramel. Its smooth and pleasant flavors complement without overwhelming, even when sampled with a local goat cheese served with peach preserves. Ewe’s Blue, a sheep’s milk cheese made in the style of Roquefort by Old Chatham Sheepherding Company is my winning combination with the Baby Bourbon. 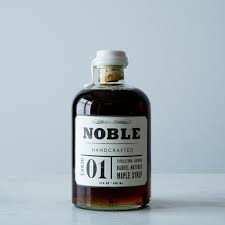 Add some candied walnuts and Noble Tonic 01 maple syrup (matured in Tuthilltown’s bourbon barrels) to make this pairing soar off the charts! Maple syrup to die for, amazing! At a local spirit and cheese event in NYC, I sampled Tuthilltown’s Hudson New York Corn Whisky with a variety of cheeses. Straight, it was a standout when paired with Nettle Meadow Farm’s lusciously silky triple crème, Kunik, made from a blend of cow and goat’s milk. The flavors of each melded together to create a bit of pairing heaven, reminiscent of hot buttered corn muffins. A drizzle of honey took this pairing over the top – a stupendous combination I’ll try again soon. A cocktail blended from equal parts New York Corn Whiskey and Atsby Armadillo Cake (artisan NY vermouth) was a stellar choice for 5 Spoke Creamery’s Tumbleweed, an aged cow’s milk cheese. The sharp acidity of the cheese was rounded out by the interesting rich flavors of the drink – absolutely delicious! The vermouth, made with a blend of herbs, flowers and spice (even a touch of dried mushroom) added layers of complexity and lifted the rich flavors in the whiskey, also making it more versatile for pairing. For the ultimate in local flavor I suggest Harvest Spirits’ Cornelius Applejack, made from over 60 lbs. of apples per bottle. Since colonial times, traditional applejack was made by freezing barrels of hard cider during the long winter months, then tapping and removing the alcoholic center. This was a powerful and harsh liquor, since it concentrated all of the alcohols – both good and bad. Carefully distilled two times and rested in bourbon barrels, Harvest’s Applejack offers a smoother, more satisfying take on this American classic. On the nose: apples? Sure, but less present than you think: This is surprisingly far more whiskey-like than any applejack I’ve had. The body backs that up, with clear vanilla notes, wood, and a smooth cocoa finish. Try it with Hawthorn Valley’s aged cheddar. Delish! Experiment with your favorite spirits and cheese – it’s fun and you just may find a new favorite to add to your repertoire. I’ve found it’s best to stick with two to three cheeses as not to overwhelm your palate. Serve with a selection of nuts, jams and dried fruits and good friends! Enjoy!